This rustic pine cone sconce is available in your choice of finish and can add charm and a cabin look to your rustic or western style home. Made in the USA. 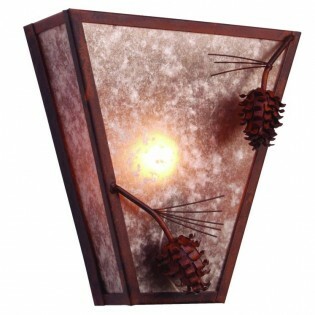 The 3-D pine cones on is rustic sconce can add charm and a cabin look to your home. The Ponderosa Pine Cone Vegas Sconce is crafted by hand from recycled steel this lodge style pine cone sconce uses one 60 watt max bulb and measures 10"W x 10.5"H x 4.5" D. Made in the USA.